Dental caries is one of the most common childhood diseases, affecting up to 80% of all individuals at some stage of their lives. It is a debilitating and painful condition which impacts on mastication, speech, aesthetics and psychosocial behaviour. 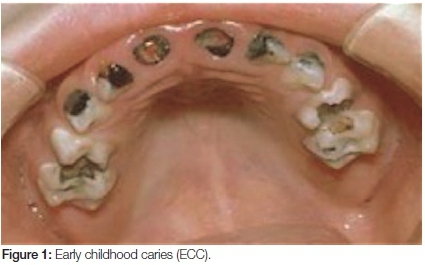 The prevalence of caries in South African children is around 40% and almost half of this burden goes untreated. The end results are pain, swelling and abscess formation, all of which have negative effects on aspects of the lives of the patients. 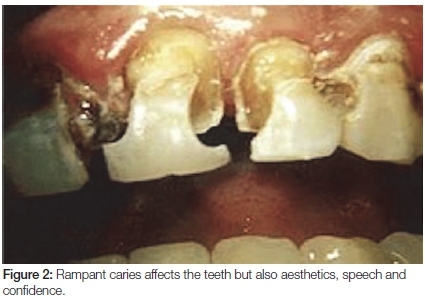 Although dental caries is preventable, the prevalence continues to remain relatively high. 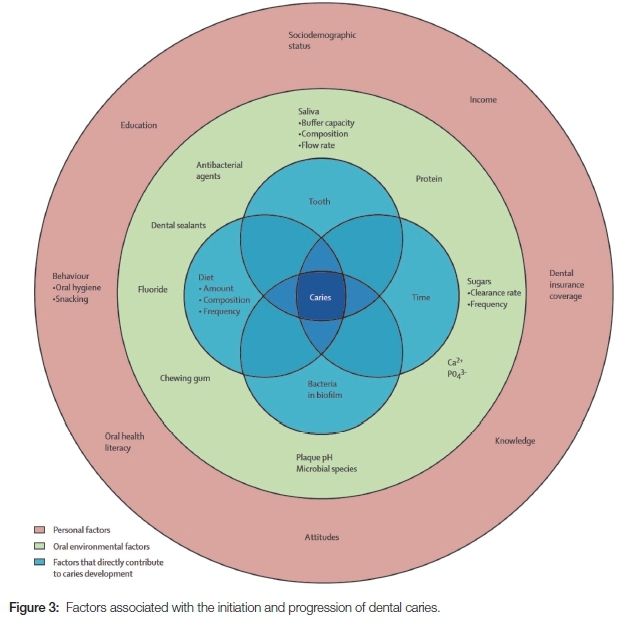 This paper discusses the spread of caries and some of the methods by which it can be reduced and/or prevented. It is accepted by authorities such as the American Association of Paediatric Dentists that DC is an infectious and transmissible disease which is multifactorial and is strongly modified by diet.3-6 The aetiological factors include direct agents such as cariogenic bacteria and diet, the oral environment (saliva flow and composition) and personal factors (including oral hygiene) as reported by Selwitz et al (Figure 3).7 The personal factors also include education, socioeconomic status and immunological factors.5,6 Therefore, to control the spread of DC, there needs to be a multipronged approach targeted at both the direct and indirect etiological agents. This paper examines some of these etiological factors and provides practical solutions that could be implemented in the endeavour to control and prevent DC. SM is part of the normal flora and as a result probably cannot be completely eliminated. However, the levels can be controlled by adequate oral hygiene and removal of plaque. Literacy and socioeconomic factors also play vital roles in the prevention and spread of DC, as these considerations affect access to oral health services and to oral hygiene necessities such as toothbrushes and fluoridated toothpaste. There is overwhelming evidence that sugars and other fermentable carbohydrates, such as highly refined flour, play a role in the initiation and development of DC. Sucrose metabolism produces dextran, which promotes superior bacterial adhesion to teeth. As a result it is considered the most important substrate in the establishment of cariogenic bacteria. The frequency of sucrose intake has been shown to be more important than the total amount consumed.5,6 An increased frequency results in a decrease of the pH of the oral cavity, which enhances the establishment and dominance of SM. The duration of the sugar in the mouth directly increases the potential for enamel demineralization and reduces the time for remineralization by saliva, with the result that demineralization becomes the predominant activity. A tooth is most susceptible to caries immediately after eruption. The process of enamel maturation continues following tooth eruption, the teeth becoming less susceptible to decay over time. Disturbances during embryo-logical development can result in defects on the surface enamel which could render the enamel more susceptible to DC compared with healthy enamel. These disturbances could be caused by premature birth or low-birth weight, pre- and postnatal infection/illness, nutritional deficiencies and a variety of environmental pollutants such as maternal smoking.6,13 Many of these disturbances can be prevented with adequate knowledge, access to health care and an improvement in education and literacy. As oral health practitioners, it is our duty to provide nutritional and educational advice to pregnant mothers to reduce the possibility of these defects. Saliva is often referred to as "liquid gold" in the oral environment.13 It consists of a complex composition having, amongst other components, ions, enzymes and antibodies. The ions include calcium, fluoride, and magnesium, all of which are essential for tooth remineralisation. As long as the saliva is saturated with these ions, remineralization of the tooth is possible which would result in the reversal of the initiation of early DC.13 Saliva also has the ability to buffer the pH of the oral cavity, and to shift it from an acidic (demineralization) to a basic environment which promotes remineralisation. As a result, salivary flow and favourable composition are essential in the natural prevention of DC.14 Studies have also shown that children with a low saliva buffering capacity and high counts of SM and LB were more likely to develop severe DC compared with controls with lower bacterial counts and better saliva buffering capacity.10 Hence, oral health practitioners should test patients' saliva flow and composition with chair side saliva test kits which would then allow them to provide tailor made oral hygiene and diet instructions for each individual. A reduced salivary flow could be the result of side effects of certain medications, old age, dehydration and other genetic factors. High- risk patients should have their saliva flow and composition monitored regularly and if necessary, saliva substitutes and stimulants (sugar free chewing gum) can be discussed and recommended. Clinical signs of a dry mouth include rampant caries, burning mouth, dry tongue, and halitosis. Another effective prevention strategy is the placement of fissure sealants (FSs) on permanent molars.17 These sealants protect the most vulnerable surface of the tooth (occlusal pits and fissures), and as a result have reduced the global prevalence of DC. The placement of FSs is simple and cost effective, and sealants have been proven to reduce both the initiation and progression of DC.17 Indeed, it may be argued that all children should receive FSs on their permanent molars as soon as these teeth erupt in the mouth. a. Community based strategies that focus on educating mothers regarding their dietary habits may also influence the habits of their infants. Also included should be water fluoridation policies, and personal and community preventive programmes in high risk communities. These initiatives should incorporate oral health education to all communities using a variety of media campaigns, including mass media campaigns, as well as one-to-one counselling at a private practice level. b. Provision of examination and preventive care in dental clinics and private practices. This includes screenings, early detection of caries, and the early identification of high risk patients such as young children, geriatrics, patients on medication, drug users, pregnant mothers, and mentally and physically handicapped individuals. c. Encouraging private practitioners to focus on preventive rather than curative care, by increasing the financial remuneration and incentives received from Medical Aid Schemes. d. The delivery of oral health education and instruction on improving oral hygiene and dietary practices at schools, homes, crèches and other public areas.